Curators at the Asian Art Museum recently made an astonishing discovery--three 17th c. Moghul Indian carpets! The rugs had belonged to Avery Brundage; he had used them in his home until his death in 1975. These important carpets, which had been stored away and forgotten for decades, only resurfaced when art objects were being prepared to be moved from the Museum to the Asian's new site at Civic Center. The most important of the three carpet is surely one of the most beautiful rugs in any museum. Although reduced in size, the carpet remains huge, measuring 11'7" in width and approximately 17' in length. Its design of spiky leaves and resplendent blossoms in multiple tones of blues, rose red, greens and golds covers a brilliant cherry red field. This carpet is remarkably similar to a 17th c Indian carpet from Lahore (a gift of J. Pierpont Morgan) in the Metropolitan Museum in New York, which measures 11'1" x 30'3". 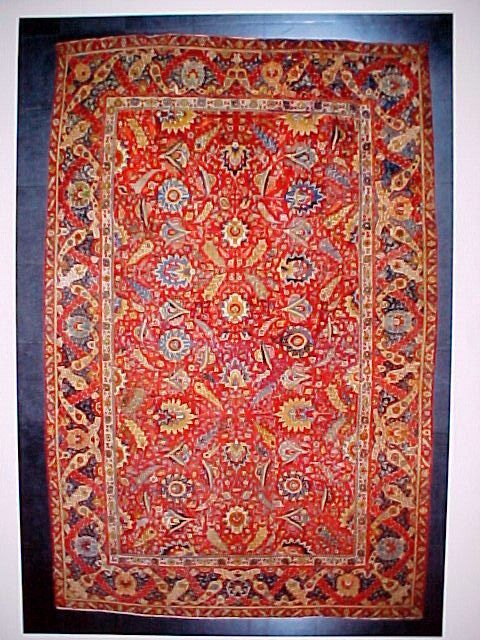 (See color plate facing fig 129 in Dimand and Mailey's Oriental Rugs in the Metropolitan Museum of Art. The field design of these two carpets is nearly identical. Not only is the overall composition virtually the same, but also the drawing of individual leaves and blossoms. However, the carpets have totally different borders. The Asian Arts carpet, has a spectacular intertwining strap/leaf arabesque border while the Metropolitan Museum rug has a more sedate cartouche border, one which also appears on a similar Lahore carpet in the Gulbenkian museum, Lisbon (see Hali 114, p80). These Lahore carpets share certain features commonly agreed to be indicative of Indian manufacture: tone-on-tone color, usually without separating outlines (for example light blue on dark blue, rose on red, gold on yellow, etc. ); a distinctive leaf design variously described as wisteria or grape-like; and thirdly, warps consisting of 5-8 strands rather than the 4 strands common to their Indo/Persian counterparts. 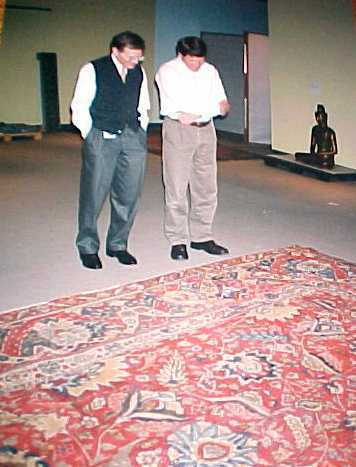 The other two Asian Art carpets belong to the so-called "Indo/Persian" class, a designation which indicates a long lasting controversy as to the origin of rugs in this group. Throughout the 19th and 20th centuries rugs of this class have variously been called Ispahan, Indo-Ispahan, Indo-Persian, and Herat. Most auction house experts, many dealers and some scholars are again calling them "Ispahan" or "Isfahan." The Indo/Persian rugs constitute a cohesive group, readily recognized by a distinctive crimson field and deep green or dark blue border. Like their Lahore counterparts, "flaming" palmettes, bi-colored leaves, and arabesques decorate the field. Borders are frequently filled with blossoms flanked by two leaves, the so- called "Herati" pattern. Currently, scholars in America usually consider the Indo/Persian group to have been woven in India. On the other hand experts in Britain and Europe usually argue for a Persian provenance, the assumption being, it seems, that if one group (the Lahores) is Indian, then the Indo/Persians must be Persian--an argument that principally rests on the their use of 4 ply weft as well as more subjective criteria such as subtle color and design variations. Yet 4 ply wefts are certainly not unknown in rugs designated as Indian. One of the two Asian Arts Indo/Persian carpets has a rare diagonal repeat compartment design similar not only to two well-known Isfahan "Polonaise" carpets in Berlin but also to Kirman "vase" carpet compartment designs. The third Asian Arts carpet has the more typical Indo/Persian design--that of a field filled with palmettes and cloudbands. These two rugs which are otherwise dissimilar share an unusual border element of small white blossom-crosses separating the blossom/leaf Herati pattern. 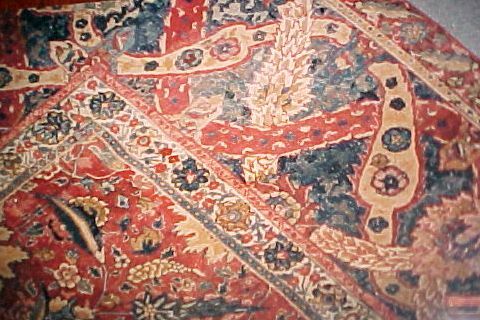 Many Indian carpets have patterns similar to those of the Persian "vase" Kirmans--for example shrub designs, compartment formats, and blossom/sickle leaf designs. Like the Indo/Persian group, "vase" Kirmans also frequently have crimson fields and dark blue borders. Based on our knowledge of important trade patterns between Persia and India, we may reasonably assume that the designs of both the Polonaise Isfahans and Indian rugs derive in large part from the spectacular vase carpets of Kirman. When the three Asian Arts carpets are seen together, it is difficult for us to believe they came from such widely different areas as Persia and India. Despite the slight difference in construction (4 strand warp rather than 5-8), from the back, the weave of all three rugs appears strikingly similar. Their use of colors and color harmonies are the same--the golds, blues, greens, and shades of crimson appear to originate from the same geographical area. 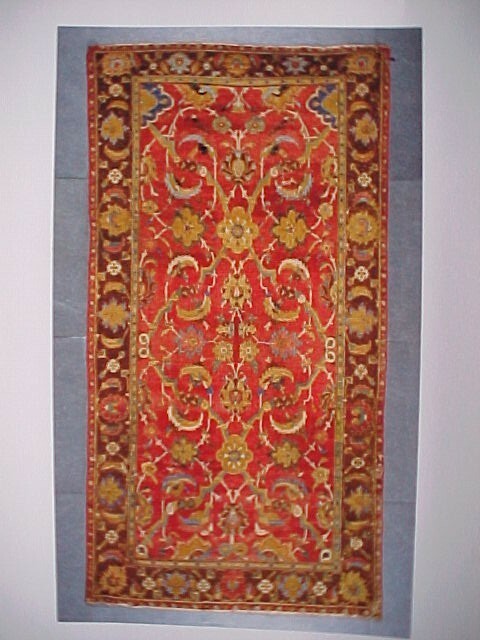 As some scholars have noted, Jose Ferrandis Torres' 1933 exposition catalogue Alfombras Antiguas Espanolas lists a very large number of long, narrow rugs having crimson fields and green borders specifically mentioned in early inventories as coming from India--"una alfombra de la India de Portugal" (a carpet from India coming from Portugal). It seems reasonable to assume that the rugs mentioned by Torres are Indo/Persian a conclusion evidenced by the large numbers of these 17th century rugs still on view in museums and churches in Portugal and Spain. Finally, especially significant is the fact that carpets from both groups once owned by the Maharaja of Jaipur still retain labels identifying their origin as Lahore. This fact would seem to definitively settle the controversy. 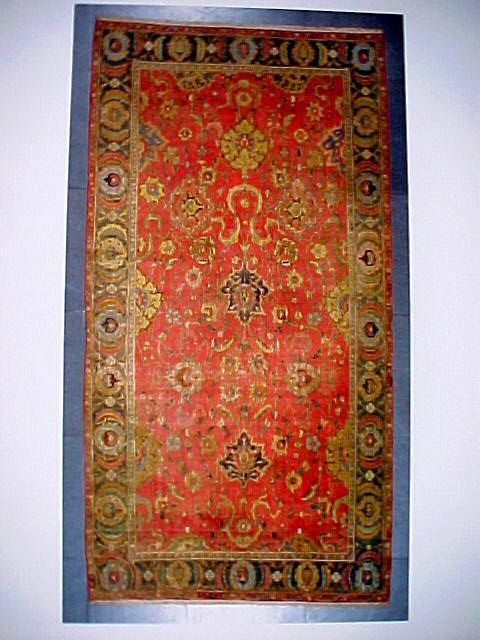 Thus we may regard the three Asian Arts carpets as Moghul Indian rugs. Whatever the provenance, however, they are a significant addition to the Asian Art Museum's growing collection of Asian rugs.